Vintage Bollywood poster of the 1970 classic Hindi film directed by Raj Kapoor, Mera Naam Joker for sale. This is an actual surviving vintage Bollywood poster of the 1970 film that was produced and directed by the showman of Indian cinema, Raj Kapoor. This film, like many others released under the banner of RK Productions, starred Raj Kapoor in the lead role. In this classic, Raj Kapoor essayed the role of a circus clown who must make his audience laugh at the cost of his own sorrows. Mera Naam Joker also marked the debut of Rishi Kapoor, making this poster highly collectible. Printed and circulated several years after the first release of the film (somewhere in the 1980s), this Mera Naam Joker poster was originally designed for publicity of the film’s subsequent release in Delhi but never ended up being used. This Raj Kapoor movie poster was originally designed in hand painted canvas format by a small time art studio in Delhi, giving it a very quirky appearance. 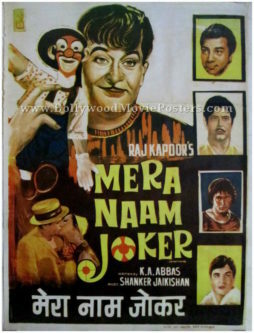 A hand drawn portrait of Raj Kapoor holding the iconic Mera Naam Joker doll is seen prominently in this Mera Naam Joker movie poster. The sensational kissing scene between Raj Kapoor and Russian actress Kseniya Ryabinkina is seen in a smaller hand painted rendition at the bottom. Smaller hand painted portraits of the film’s stellar star cast of male supporting actors such as Rishi Kapoor, Dharmendra, Dara Singh and Rajendra Kumar are also seen in this Mera Naam Joker film poster. Mera Naam Joker reportedly took six years to make and was funded by Raj Kapoor’s personal savings. The film was declared a flop at the box office but has attained cult status over the years and earned the praise of critics. Bollywood movie poster for sale of one of the greatest films in Indian cinema, Bobby (1973). Featured here for sale is a Bollywood poster of the iconic 1973 film that featured Rishi Kapoor and Dimple Kapadia in lead roles. Printed and circulated three decades after the first release of the film (2000s), this Bobby poster was designed and printed for publicity of a more recent screening of the film but never ended up being used. Bobby has been ranked consistently as a must-see and one of the greatest films in Indian cinema, making this Bollywood movie poster for sale highly collectible! Bobby is a 1973 romantic Hindi film directed by Raj Kapoor, starring his son Rishi Kapoor opposite debutante Dimple Kapadia. The film was a blockbuster hit, owing largely to its pioneering plot that revolved around teenage romance (a taboo at the time of the film’s release). Bobby won numerous awards including the 1974 Filmfare Award for Best Actor (Rishi Kapoor) and Filmfare Award for Best Actress (Dimple Kapadia). Songs from the film went on to become the greatest ever in Bollywood. Tracks like “Hum Tum Ek Kamre Mein Band Ho,” “Jhoot Bole Kauva Kate,” “Main Shayar To Nahin” & “Na Mangu Sona Chandi” are played till today. Bollywood poster for sale of one of the greatest films in Indian cinema, Bobby (1973). Featured here for sale is a poster of the iconic 1973 Hindi film that featured Rishi Kapoor and Dimple Kapadia in lead roles. Printed and circulated three decades after the first release of the film (2000s), this Bobby movie poster was designed and printed for publicity of a more recent screening of the film but never ended up being used. Bobby has been ranked consistently as a must-see and one of the greatest films in Indian cinema, making this Bollywood poster highly collectible! 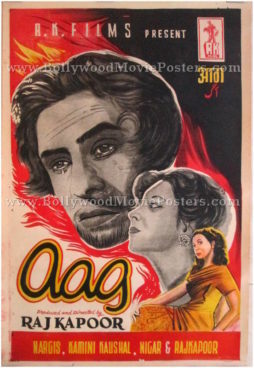 Old Bollywood movie poster for sale of the classic Hindi film, Aag (1948). This is an actual surviving old Bollywood poster for sale of the 1948 film that was produced and directed by the “greatest showman of Indian cinema” (also known as “the Clark Gable of the Indian film industry”), Raj Kapoor. The film starred Raj Kapoor, Nargis, Nigar Sultana, Kamini Kaushal, Shashi Kapoor and Premnath. Raj Kapoor’s youngest brother Shashi Kapoor appeared as a child artist in Aag, playing the younger version of his character. Aag was the first film in which Raj Kapoor and Nargis appeared together, making this old Bollywood poster highly collectible! After Aag, Raj Kapoor and Nargis appeared in another 15 films together, becoming the most iconic on screen couple in the history of Indian cinema. Printed and circulated several years after the original first release of the film (somewhere in the 1960s), this Raj Kapoor movie poster was printed for publicity of a subsequent release of the film but never ended up being used. This Raj Kapoor poster was originally designed in hand painted oil on canvas format by Bollywood poster artist O.P. Bangali. Dramatic brush strokes are seen in the fiery background of this Raj Kapoor film poster. The artist depicts the showman in a rather sombre mood in a large close up portrait, with a smaller depiction of actress Nargis appearing alongside. This Raj Kapoor Nargis poster is set against a fiery red background with eye catching typography used in the title. Reissue Bollywood poster of the Raj Kapoor classic, Satyam Shivam Sundaram (1978) for sale. 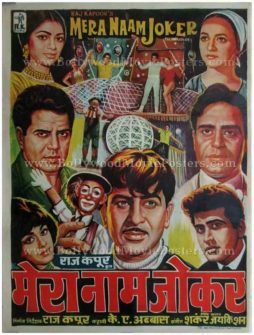 Featured here for sale is a recent reissue Bollywood poster of the classic Hindi film Satyam Shivam Sundaram. Directed and produced by the Showman of Indian cinema Raj Kapoor, the film starred Shashi Kapoor & Zeenat Aman in lead roles. Printed and circulated somewhere in the early 2000s, this reissue Bollywood movie poster was originally designed for publicity of the recent re-release of the film but never ended up being used. The two lead actors Shashi Kapoor & Zeenat Aman are seen in a photographic still taken from a key scene in the film. Brilliant typography is seen in the logo of this Satyam Shivam Sundaram poster. 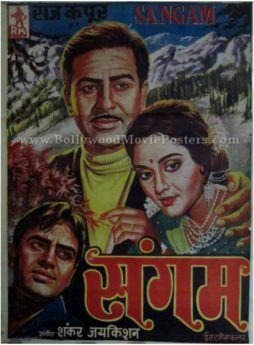 The message, “Love sublime filmed by Raj Kapoor” is seen on the top right hand corner of this Satyam Shivam Sundaram poster. Music composers Laxmikant-Pyarelal won the Filmfare Best Music Director Award for their brilliant composition in Satyam Shivam Sundaram. The title track “Satyam Shivam Sundaram” sung by Lata Mangeshkar is fondly remembered and played till today. Old Bollywood poster for sale of the Raj Kapoor cult classic, Sangam (1964). 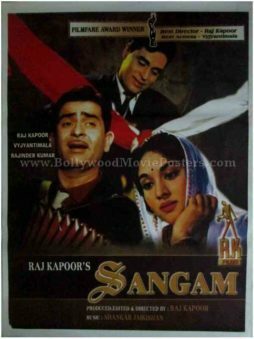 Featured here for sale is an old Bollywood poster of the super hit Hindi film Sangam, directed and produced by the Showman of Indian cinema Raj Kapoor, featuring him in a leading role opposite Vyjayanthimala. The love triangle also starred Rajendra Kumar. Released in Technicolor, Sangam was Raj Kapoor’s first color film, and is considered one of his finest, making this old Bollywood poster highly collectible. Printed and circulated somewhere in the late 1970s, this old Raj Kapoor film poster was originally designed for publicity of the film but never ended up being used. A beautiful hand painted rendition of Raj Kapoor and Vyjayanthimala is seen prominently in the center, set against a picturesque background. Rajendra Kumar is seen in a smaller hand drawn avatar at the bottom of this old Bollywood poster for sale. The magnum opus spared no expense in its shoot, with many scenes shot in exotic foreign locations such as Venice, Paris, and Switzerland. Sangam is credited with starting the trend of shooting expensive song sequences in foreign locations outside India. The music album of the film was a blockbuster. Songs like “Bol Radha Bol,” “Dost Dost Na Raha,” “Har Dil Jo Pyaar Karega,” “Yeh Mera Prem Patra,” “Main Kya Karoon Ram” are fondly remembered and played till date. Old Bollywood poster of the 1970 cult Hindi film Mera Naam Joker for sale. This is an actual surviving original Turkish Bollywood poster of the 1970 film that was produced, directed by and starring the showman of Indian cinema, Raj Kapoor. This extremely unique and very rare Turkish Mera Naam Joker movie poster was designed and printed for the promotion of the film in Turkey. Mera Naam Joker was dubbed in Turkish and released in theaters across Turkey with the title “Palyaço,” which in Turkish means clown. The unique artwork seen in this old Mera Naam Joker movie poster was designed exclusively for the film’s promotion inside Turkish theaters and was only used in Turkey, making it truly one-of-a-kind and highly collectible! Mera Naam Joker was dubbed in Turkish and released in Turkey a couple of years after the original Hindi release of the film. This original Mera Naam Joker film poster was printed in the early 1970s and distributed to cinemas in Turkey that screened the film. Extremely limited posters of this design were made and only a handful have survived till date. 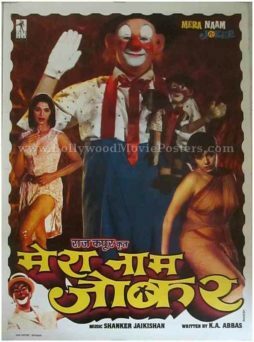 In this original Mera Naam Joker movie poster, Raj Kapoor is seen in a brilliant photographic still holding the iconic Mera Naam Joker doll. Reissue Bollywood poster of the Raj Kapoor cult classic, Sangam (1964) for sale. 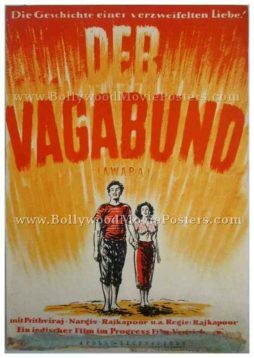 Featured here for sale is a recent reissue Bollywood poster of the super hit Hindi film Sangam, directed and produced by the Showman of Indian cinema Raj Kapoor, featuring him in a leading role opposite Vyjayanthimala. The love triangle also starred Rajendra Kumar. Released in Technicolor, Sangam was Raj Kapoor’s first color film, and is considered one of his finest. Raj Kapoor is seen prominently playing the accordion on the left. A beautiful still photo of actress Vyjayanthimala appears alongside. Rajendra Kumar is seen in a smaller still on the top. The poster capitalizes on the two Filmfare awards (Best Director & Best Actress) bagged by the film with an announcement on the top. Reissue Bollywood poster of the Raj Kapoor cult classic, Shree 420 (1955) for sale. 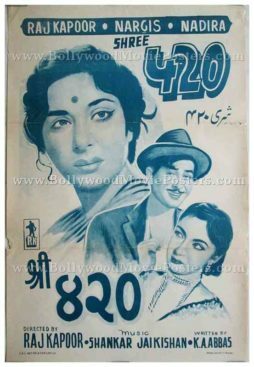 Featured here for sale is a recent reissue Bollywood poster of the cult Hindi film Shree 420 (translated as Mr. 420 and sometimes also spelled as Shri 420). Shree 420 is a 1955 Bollywood classic directed and produced by the Showman of Indian cinema Raj Kapoor, featuring him in a leading role opposite Nargis. Printed and circulated somewhere in the early 2000s, this reissue Bollywood movie poster was originally designed for publicity of the recent re-release of the film but never ended up being used. Raj Kapoor is seen prominently in his classic Tramp avatar in this Shree 420 poster. Nargis is seen resplendent in white in the background. An iconic scene from the film depicting Raj Kapoor and Nargis holding an umbrella on a rainy night, singing the blockbuster hit song, “Pyar hua ikrar hua” is seen on the top right of this Shree 420 poster. The “Pyar hua ikrar hua” image depicting Raj Kapoor and Nargis singing and dancing under a shared umbrella in pouring rain is regarded as one of the most iconic images in Bollywood. Shree 420 is widely regarded as a classic in Indian cinema. Raj Kapoor is remembered as the greatest showman in Indian cinema – an all rounder who produced, directed as well as starred in some of the leading films of his time. In Shree 420, Raj Kapoor’s character is heavily influenced by Charlie Chaplin’s “little tramp”, similar to his character in a film that released four years prior in 1951 called Awaara. The film has to its credit some of the greatest songs ever made in Bollywood such as “Mera Joota Hai Japani” (My shoes are Japanese), which went on to become a patriotic symbol of the newly independent India. In India, Shree 420 became the highest grossing film of the year (1955). In Russia, Shree 420 received mass appeal and made Raj Kapoor a household name. Extremely rare original Bollywood poster of one of the greatest Hindi films ever made in the history of Indian cinema, Awara (1951) for sale. Awara (sometimes spelled as Awaara) is a 1951 blockbuster directed and produced by Raj Kapoor, featuring him in a leading role opposite Nargis. The film is considered Raj Kapoor’s finest performance ever. 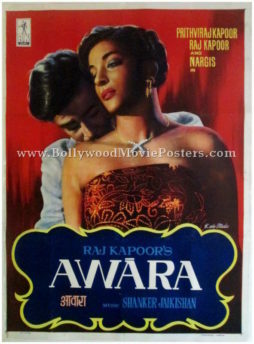 This is an actual surviving original vintage Raj Kapoor movie poster of the cult classic, Awara. Printed and circulated during the original first release of the film in the early 1950s, this vintage Bollywood movie poster was originally designed for publicity of the film but never ended up being used. Raj Kapoor and Nargis had unbeatable chemistry together, and Awara much like Raj kapoor’s other films, showcased the sensuality and beauty of Nargis to perfection. This is reflected in the poster with a beautiful portrait of Raj Kapoor and Nargis in an iconic sensuous pose set against a deep red background. This is the only film ever made in the history of Bollywood that had many generations of the Kapoor family starring together on screen. This vintage Bollywood poster has been professionally restored by an expert paper archivist. It has been backed on cotton using a thorough acid-free conservation and restoration process. Minor paper loss has been adequately filled which make no noticeable difference to the display quality of the poster when seen from a viewing distance. Close up images of each of the individual restored areas on this vintage Bollywood poster have been provided alongside for greater clarity. Awara (Tramp) is an iconic 1951 Hindi film directed and produced by Raj Kapoor. Music of the film was composed by Shankar Jaikishan. The film stars Raj Kapoor and Nargis in lead roles while Raj Kapoor’s father Prithviraj Kapoor stars as his on-screen father. Kapoor’s youngest real-life brother Shashi Kapoor also plays the younger version of his character in a cameo. Prithiviraj’s father Dewan Bashwanath Kapoor also has a cameo role in Awara – his only film appearance. Raj Kapoor’s ‘tramp” character in the film was influenced heavily by Charlie Chaplin. The film became a rage throughout South Asia and found overseas success primarily in the Soviet Union. Songs of the film such as “Awara Hoon” (I am a Tramp) and “Ghar Aaya Mera Pardesi” became blockbuster hits, which are remembered and played till today. The film was also nominated for the Grand Prize of the Cannes Film Festival in 1953. Owing to its popularity in so many countries, in 2012, Awaara was included in the 20 new entries added to the coveted All-Time 100 greatest films list by TIME. After the widespread success of the film, Raj Kapoor carried this “tramp” character (influenced heavily by Charlie Chaplin) forward in subsequent films such as Shree 420. The music for this film was composed by Shankar Jaikishan while the songs were written by Shailendra and Hasrat Jaipuri. Songs from the film find place on the list of 100 Greatest Bollywood Soundtracks of all time. In 2003, Time magazine added Awara to a list of “10 Indian Films to Treasure”. Time magazine also chose Raj Kapoor’s performance in Awaara as one of the top ten greatest performances of all time. In India, the film grossed a record of over Rs. 12 million. In the Soviet Union, Awara is estimated to have drawn between 40 to 63 million viewers to cinemas across the nation. It remained the most successful Indian film in the Soviet Union up until films like Bobby, Seeta Aur Geeta and Disco Dancer achieved a similar level of success there. The film was also a nationwide success in China, where the song “Awara Hoon” and actor Raj Kapoor became widely known across the nation, much like in the Soviet Union. The film’s success in both the Soviet Union and China has been attributed to the socialist themes expressed in the film. The film Awara and the song “Awara Hoon” are believed to have been Chairman Mao’s (founder of People’s Republic of China 1949) favourite film and song, respectively. Due to the film’s remarkable success in Turkey, Awara was remade in Turkey as Avare in 1964 with a local cast. Original vintage Bollywood poster of the Raj Kapoor cult classic, Shree 420 (1955) for sale. This is an actual surviving old Bollywood poster of the Hindi film Shree 420 (translated as Mr. 420 and sometimes also spelled as Shri 420). Shree 420 is a 1955 Bollywood classic directed and produced by the Showman of Indian cinema Raj Kapoor, featuring him in a leading role opposite Nargis. Printed and circulated somewhere in the 1970s, this vintage Bollywood movie poster was originally designed for publicity of the re-release of the film but never ended up being used. This old Raj Kapoor film poster was originally designed in hand painted, oil on canvas format by a small time art studio in Delhi, giving it a very quirky appearance. The entire poster has been printed in a single vintage ink blue color, presumably to bring down the cost of printing. The three leading characters of the film are seen in beautifully drawn vintage portraits in this Shree 420 original movie poster. The emotion in Nargis’ portrait has been captured beautifully by the artist. Raj Kapoor appears in his classic Tramp avatar in this old hand painted Bollywood poster. 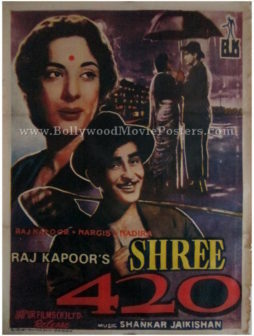 Extremely rare original old Raj Kapoor film poster of the cult Bollywood classic, Shree 420 (1955) for sale. This is an actual surviving original East German publicity poster of the 1955 black and white Bollywood film produced, directed by and starring the greatest entertainer of all time in Bollywood, Raj Kapoor (also known as The Show Man of Indian cinema). This extremely unique promotional mini-poster (roughly A4 size) was designed and printed in East Germany during the Cold War for publicity of Shree 420 in East German theaters. The unique hand painted artwork seen in this old Bollywood movie poster was designed exclusively for the film’s promotion inside East German theaters and was only used in East Germany, making it truly one-of-a-kind and highly collectible. This old Raj Kapoor Bollywood poster was printed and circulated during the original first release of the film in East Germany during the Cold War (late 1950s). This was the official promotional poster designed and printed for publicity of the film in East German theaters in the late 1950s but never ended up being used. Printed in the late 1950s on vintage East German paper, very few posters of this type were made and only a handful have survived till date. Featured here for sale is an almost impossible to find original East German Raj Kapoor Bollywood movie poster! This old hand painted Bollywood poster bears an extremely unique design that features a brilliant hand painted portrait of Raj Kapoor, who is seen in his iconic “Tramp” character inspired heavily from Charlie Chaplin. The charcoal pencil sketch effect used in Raj Kapoor’s portrait is also seen in the background where a silhouette of the Taj Mahal appears. The title of the film is seen in German as well as translated into English in brackets below. Shree 420 is a 1955 Bollywood classic directed and produced by Raj Kapoor, featuring him in a leading role opposite Nargis. The film is widely regarded as a cult classic in Indian cinema. In Shree 420, Raj Kapoor’s character is heavily influenced by Charlie Chaplin’s “little tramp”, similar to his character in a film that released four years prior in 1951 called Awara. The film has to its credit some of the greatest songs ever made in Bollywood such as “Mera Joota Hai Japani” (My shoes are Japanese), which went on to become a patriotic symbol of the newly independent India. In India, Shree 420 became the highest grossing film of the year (1955). In Russia, Shree 420 received mass appeal and made Raj Kapoor a household name. 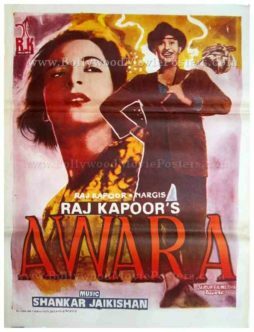 Extremely rare original old Raj Kapoor film poster of the cult Bollywood movie, Awara (1951) for sale. This is an actual surviving original East German publicity poster of the 1951 black and white Bollywood film produced, directed by and starring the greatest entertainer of all time in Bollywood, Raj Kapoor (also known as The Show Man of Indian cinema). This extremely unique promotional mini-poster (roughly A4 size) was designed and printed in East Germany during the Cold War for publicity of Awara in East German theaters. This old Raj Kapoor Bollywood poster was printed and circulated during the original first release of the film in East Germany during the Cold War (mid 1950s). This was the official promotional poster designed and printed for publicity of the film in East German theaters in the mid 1950s but never ended up being used. Printed in the mid 1950s on vintage East German paper, very few posters of this type were made and only a handful have survived till date. This old hand painted Bollywood poster bears an extremely unique design that features a brilliant hand painted portrait of Raj Kapoor & Nargis holding hands. The title of the film is seen in German as well as translated into English in brackets below. This is the only film ever made in the history of Bollywood that had so many generations of the Kapoor family starring together on screen! The film became a rage throughout South Asia and found overseas success primarily in the Soviet Union. Songs of the film such as “Awara Hoon” (I am a Tramp) and “Ghar Aaya Mera Pardesi” became blockbuster hits, which are remembered and played till today. The film was also nominated for the Grand Prize of the Cannes Film Festival in 1953. Owing to its popularity in so many countries, in 2012, Awaara was included in the 20 new entries added to the coveted All-Time 100 greatest films list by TIME. Old Bollywood poster of the 1970 Hindi film directed by Raj Kapoor, Mera Naam Joker for sale. Printed and circulated several years after the first release of the film (Late 1980s), this Mera Naam Joker movie poster was originally designed for publicity of the film but never ended up being used. This Raj Kapoor film poster was originally designed on a hand painted canvas by a small time art studio in Delhi, making it highly collectable. 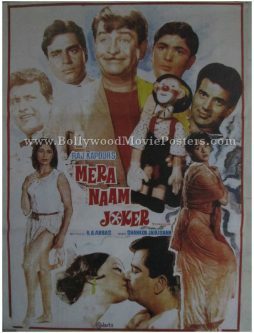 A quirky portrait of Raj Kapoor holding the iconic Mera Naam Joker doll is seen on the bottom center of this Mera Naam Joker film poster. Close up hand painted portraits of the film’s stellar star cast of supporting actors such as Simi Garewal, Manoj Kumar, Dharmendra, Kseniya Ryabinkina & Rajendra Kumar are seen painted all around this quirky Bollywood poster. Original vintage hand drawn Bollywood movie poster of the Raj Kapoor hit, Barsaat (1949) for sale. This is an original Bollywood poster of the 1949 film directed by the “Showman of Indian cinema” Raj Kapoor, which featured him in the lead role opposite Nargis. The film also marked the debut of actress Nimmi. Barsaat was one of the first major hits directed by Raj Kapoor. Following the success of Barsaat, Raj Kapoor purchased the iconic RK Studios in 1950, making this poster highly collectible! Printed and circulated a few years after the first release of the film (1960s), this rare Raj Kapoor movie poster was originally designed for publicity of the movie but never ended up being used. This quirky hand drawn Bollywood poster features Raj Kapoor and Nargis in a beautiful romantic pose. 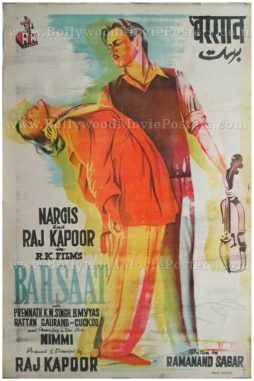 The artwork in this rare Barsaat 1949 movie poster was so iconic that it went on to inspire the logo of R K Studios. Much more than just a poster, this rare Raj Kapoor movie poster is an icon of Indian cinema! Barsaat is a 1949 Bollywood film directed by Raj Kapoor. It is one among several films to feature the super hit duo of Raj Kapoor and Nargis. The film is fondly remembered till today for its super hit music, which was composed by debutante music directors Shankar Jaikishan. Barsaat established their careers as India’s finest music directors in the years to come. Original vintage hand painted Bollywood movie poster of the Raj Kapoor hit, Barsaat (1949) for sale. Printed and circulated during the first release of the film (1950s), this rare Raj Kapoor film poster was originally designed for publicity of the movie but never ended up being used. This beautifully hand painted Bollywood poster was designed by master artist Dr S. M. Pandit – the most highly acclaimed and sought after portrait artist in India of his time. The poster depicts the signature realism of SM Pandit’s paintings. Raj Kapoor and Nargis are seen in a beautiful romantic pose set against a red background. Such was the appeal of SM Pandit’s fine artwork in this Barsaat 1949 movie poster that it went on to inspire the iconic R K Studios logo. 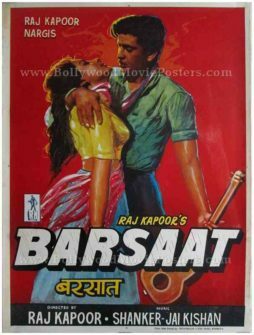 Much more than just a poster, this rare Barsaat movie poster is an icon of Indian cinema! 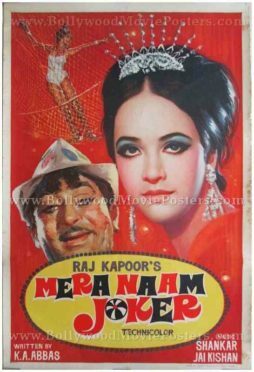 Re-issue Bollywood movie poster of the 1970 Hindi film directed by Raj Kapoor, Mera Naam Joker for sale. This is a re-release Bollywood poster of the 1970 film that was produced and directed by the showman of Indian cinema, Raj Kapoor. This film, like many others released under the banner of RK Productions, starred Raj Kapoor in the lead role. In this classic, Raj Kapoor essayed the role of a circus clown who must make his audience laugh at the cost of his own sorrows. Mera Naam Joker also marked the debut of Rishi Kapoor. Printed and circulated several years after the first release of the film (Late 1990s), this Mera Naam Joker movie poster was originally designed for publicity of a recent re-release film but never ended up being used. 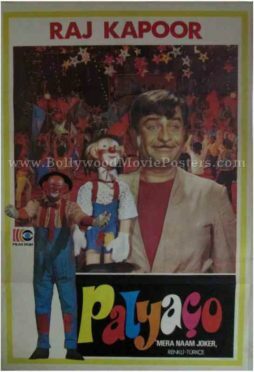 This Bollywood poster features a close up still photograph of Raj Kapoor dressed as a circus clown, holding a stuffed toy in his hand. Simi Garewal is seen in a scintillating avatar on the left. Very rare original vintage Bollywood poster of the 1970 Hindi film directed by Raj Kapoor, Mera Naam Joker for sale. Printed and circulated somewhere during the first release of the film (Late 1960s), this Mera Naam Joker movie poster was originally designed for publicity of the film but never ended up being used. This Bollywood poster was originally designed on a hand painted canvas, making it highly collectable. A stunning close up portrait of Raj Kapoor over painted with a knife to add a rugged texture is seen on the left of this Mera Naam Joker film poster. His love interest, Russian actress Kseniya Ryabinkina appears in a beautiful hand painted avatar alongside. Beautiful vintage Bollywood poster of one of the greatest Hindi films ever made in the history of Indian cinema, Awara (1951) for sale. This is an actual surviving old Raj Kapoor movie poster of the Jaipur Release of Awara. Printed and circulated somewhere in the 1960s/1970s, this vintage movie poster was originally designed for publicity of the film but never ended up being used. Raj Kapoor and Nargis had unbeatable chemistry together, and Awara much like Raj kapoor’s other films, showcased the sensuality and beauty of Nargis to perfection. This is reflected in the poster with a large dreamy hand painted close up of Nargis. 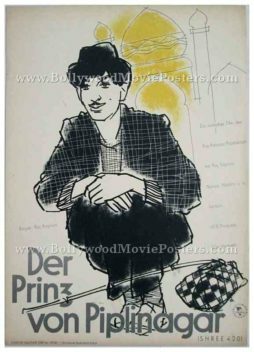 Raj Kapoor’s ‘tramp” character in the film was influenced heavily by Charlie Chaplin as is evident from his hand drawn portrait in the poster. This is the only film ever made in the history of Bollywood that had so many generations of the Kapoor family starring together on screen. Beautiful vintage Bollywood poster of the epic Hindi film Shree 420 (1955) for sale. 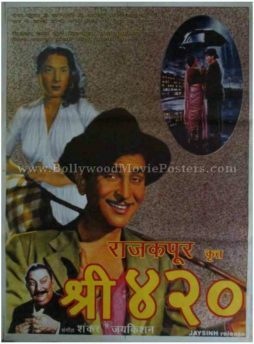 This is an actual surviving poster of the Jaipur release of Shree 420 (translated as Mr. 420 and sometimes also spelled as Shri 420). Shree 420 is a 1955 Bollywood classic directed and produced by Raj Kapoor, featuring him in a leading role opposite Nargis. Printed and circulated somewhere in the 1960s/1970s, this vintage movie poster was originally designed for publicity of the re-release of the film but never ended up being used.